Yesterday, in preparation for a session I'm doing at BlogHer Boston, I created a quiz for folks to self-assess how much information overload was a factor. I got some great feedback and was able to revise the quiz - thanks. One of the questions was to identify whether or not you are spending too much time online. The question "Is the only time you're offline when you're sleeping or going to the bathroom?" Well, it seems that some people Twitter from the toilet with their cell phones and others, if the Internet connection is good, take their laptops with them too. So, that question was revised! Laura Whitehead scored a reasonable 9 on the quiz (which means she has some good and bad habits). She wrote up a brilliant reflection on how she is changing some of her online work habits. Jack Vinson, who scored an admirable 5, noted it isn't about the too much information, it's more about behavior. And, Gavin Clabaugh went a few steps further and deconstructed my quiz into the components that lead to the symptoms of information overload. Now that we've acknowledged the problem or a desire to do better, what are the best surefire tips? Here's what I came up with - what am I missing? Do not feel bad about not reading the digital avalanche of email, blog posts, or web content. Get what you can get in an reasonable amount of time, don't worry about the rest. The important information will rise to the top. Don't feel guilty about mark all read or the delete button. It can be your best friend. Scanning and pattern recognition is a really important skill to have been you need to look at a lot of information. Don't feel that you have to read every blog post of the blogs you're tracking. It helps if you identify what you need to know before drinking from the fire hydrant. Set a frequency for answering blog comments via email, doing outreach, reading blogs, writing posts and other tasks. Set the time of day to check-in and a time limit - this is called time boxing. Stick to it; ignore your blog, email, or twitter until those magic times. The only time you're offline should NOT be when your are sleeping or in the bathroom. 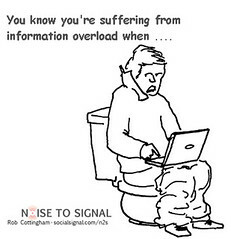 Although some people admit to twittering from the bathroom on their mobile phones and I'm sure there are others who have taken their laptops into the bathroom if the Internet reception is good. 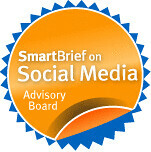 The idea is that you don't have to check your email or respond to Twitter or blog posts in real time. No one is going to die if you don't respond within 3 minutes. Remember to sort and prioritize what is urgent and what is not. It is important to carve out patches of time to allow yourself for understanding and processing the information you have consumed. This might mean disconnecting electronically on purpose. A scary thought to some but yes, power down, log off and turn off the phone and go for a walk. If you feel you have lost your concentration and productivity, it may be the stress that you give yourself by staring a monitor for too long. It is a good idea to stretch every 15-20 minutes. Even better to get up and take a walk. Drinking lots of water will not only help force you to get up from your desk, but also keep you hydrated. And, when you take a break, don't take your Iphone with you! What other types would you recommend? Thank you so much for this Beth! As a wahm, I got into a pattern of being online until the wee hours and having to get up early with the kids which meant I was too tired for exercise and foggy brained in the morning until I started the pattern all over again. The best thing I've done is type up a tenative schedule for myself with detail. I start with scheduling my run (how I stay healthy) and food breaks (otherwise I eat only on the fly) and hours that I work at my desk, time that I turn off and am present with the family, and scheduling errands in a certain window. I still twitter and check emails at the bus stop, at the grocery store and yes, in the bathroom, but having structure decreases my anxiety about what I'm not getting done. Thanks for all of the great tips...I'm listening and integrating much of what I've read here and appreciate the validation and encouragement. On the "never be caught up" point - I'd add what I've read others to say - think of your RSS feeds like an RSS river. You can jump in and play any time, and then get out any time, too. It's always going by, and you'll catch the important stuff - let the non-important stuff just flow on by. "...think of your RSS feeds like an RSS river. You can jump in and play any time, and then get out any time, too. It's always going by, and you'll catch the important stuff - let the non-important stuff just flow on by." That's a fabulous analogy. I try to tell myself that the most important stuff will come around again if I miss it, or come up in some other form. The thing I hate most is when I find I've been sucked into the Internet during family time. I get pulled in by something during time I could be talking with my partner or hanging out with my child. That's why I don't have Twhirl on my home computer. I try to make it harder for myself to go to Twitter when I'm home. I try to stay off Google Reader at home, too. Thanks for these tips. As a practioner of Tai Chi and Qigong, I can share that it's all about the yin/yang balance. The "RSS river" analogy is a good one that reminds us that we are physical beings who interact with both the physical and virtual worlds. Shoulders hunch over the keyboard, chi stagnates as we sit and sit and sit. Perhaps you could add a link to some stretching exercises for computer users? I don't have a favorite. Wonder if your readers do? I live off the electric grid and only have solar power at my office. Each morning I literally turn on my satellite in order to connect up and then shut it all down at the end of every workday. It's such a relief to see it go dark. Feels good to walk away from it. And sure enough, everything I need to know or didn't know I needed to know is there again the next day. I know most folks do not shut down their machines. It is a good practice whether you have the power to keep them running or not. * I took 1 week off from the screen and written text. No computer, no TV screen, no mobile phone display, no work-related text in paper. Without compromise, which of course means taking a week off from work (I even guess 2 weeks would have been much better, but my projects didn't allow me to). * After this week, I continued to ban Computer as well as TV from my private life for another 2 weeks (leaving a 'not available' message in my private mail and on Facebook). But at least I could work again. * Back at work after the week off, I scheduled my mobile phone to remind me to take a 5 min break from the PC screen every hour. For lunch I took a 90 min break of which I used 60 min to have a nap in an empty office. And of course, I tried to avoid overhours if possible for the first weeks. * Of course: sports! Running, biking, long walks, gym, ball games, everything where my brain doesn't have to think, but can loose itself in the physical activity. * Second, and more surprising: Singing! Sitting at home and playing guitar and singing along, or even joining a Karaoke party helped my brain to do 'something entirely different', thus getting refreshed. * Yoga exercises and meditation also contributed to my inner balance, as well as being out in nature. Hi Beth - I think the time-boxing is the key here: no e-mail till 12, that kind of thing. And given that the social media stuff is only "part" of my job, it's about parcelling that up too: generally the blog posts get written between 5 and 6pm in the office. Also, get real about which feeds are most relevant, most often: I split the feeds into daily, weekly, monthly....and then proceed to ignore that system quite a bit. Probably the main thing, which I think I learnt doing a literature degree, is to be able to scan quickly and decide whether it's relevant in a short space of time. Other than that, bookmark what might be interesting and read it when you get the headspace. Hey there! Loved today's blog post - as Regional Development Director for Constant Contact here in the DC region, part of my job entails helping people who do permission-based email marketing to NOT become part of overloading their recipients! I include many tips on frequency, and how to read their open rate and click-through reports to ensure "the right message at the right time" touches via email. Also, I always advise that email MUST be quick-read - "small juicy tidbits" really is the key. On the user side, I get help getting AWAY from my computer using the ability to pre-schedule my emails -- I write them, design them, and schedule them to be sent any day & time in the future (I do this as my life with three kids and training more than 1000 folks monthly gets TRULY hectic!! lol). I then don't sweat having to be at the computer to hit "send" at just the right time. Whew. As a staff member at a high-poverty elementary school I regularly experience information overload. 350 students, 50 staff and a few government bureaucracies can be equal to the force of many blog posts, feeds. etc. I scored a 10 on the quiz only because I am relatively new to these conversations and I have to be away from my desk covering recess, not because I have good habits. These thoughts come from years of trying to find balance in real -- not virtual -- communities, but some still apply. > Know your signs: When I realize that my best synthesis is only happening in the quiet of my morning shower, I know I need more time to think. > Recall that the most intractable social problems do not persist because of a lack of information, but because of a lack of will, power or resources. > Let Beth Kanter's wise emails pile up like a plate of warm cookies and then treat yourself to some time to enjoy them. Cookies and blog posts are often best when there is more than one, but can make you feel bad if you eat too many at one sitting. "Be OK with letting go of it all for a while"
So, needless to say, i didn't do much tweeting, commenting, RSS reading this past week ... work had to many other things going on and in my spare time i wanted to hang out with my wife and friends ... it was a great week and the internet stayed in tack while i was away.